﻿Today, most people think of Greek mythology in terms of gods such as Zeus and Hades, though, these gods are some of the most famous from the Greek pantheon, there were in fact many hundreds of Greek gods and goddesses. Many books and texts have been written on the subject of Greek gods and goddesses over thousands of years. From antiquity, Hesiod (c700BC) and Homer (c750BC) are the two most famous writers, but they were primarily recording existing oral traditions; whilst later in antiquity, Roman poets would adapt stories which were already hundreds of years old. ﻿Nevertheless, the ancient Greek pantheon can be divided into three distinct generations. According to Hesiod and Homeric tradition, the first deities of the Greek pantheon were the Protogenoi, the primordial gods and goddesses. The first god to come into creation was Chaos, a nominally female deity from whom all other deities ultimately derived. Three other Protogenoi quickly came into existence; these being Gaia (Earth), Tartarus (Hellpit) and Eros (Procreation). These first born gods would then give rise to further Protogenoi; Nyx (Night), Erebus (Darkness), Ouranos (Sky), Pontus (Sea), The Ourea (Mountains), Aether (Light) and Hemera (Day). Orphic tradition differed slightly in the names and orders of these primordial gods. The next generation of Greek gods and goddesses were the offspring of Ouranos and Gaia. Gaia would give birth to six sons and six daughters. The six male Titans being Cronus, Iapetus, Oceanus, Hyperion, Crius and Coeus, and the female Titanides named Rhea, Themis, Tethys, Theia, Mnemosyne and Phoebe. Gaia would incite the Titans to rise up against their father, and Cronus would ultimately take up a sickle to castrate Ouranos, and destroy much of the god's powers. Cronus would take up the position of supreme deity, and the rule of the Titans would then become known as the Golden Age of Greek mythology. The Golden Age of the Titans would ultimately come to an end in a similar way to the rule of Ouranos, for Gaia incited Zeus to rise up against his father, Cronus. The children of Cronus and Rhea had been imprisoned in the stomach of Cronus, although Zeus escaped this fate. When of age Zeus would release his siblings, and begin to launch a war against the Titans from Mount Olympus. A ten year war, the Titanomachy would follow, a war which ultimately Zeus and his siblings one. The division of the cosmos then saw Zeus given dominion over the heavens and earth, Poseidon was given the sea, and Hades the Underworld. 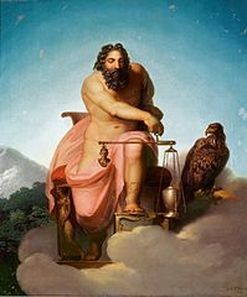 Zeus would rule from Mount Olympus and the god was joined by 11 other Greek gods and goddesses; Poseidon, Hestia, Demeter, Hera, Aphrodite, Hermes, Apollo, Artemis, Ares, Athena, and Hephaestus.